OPUS offices and Toroposada Arquitectos styling center as "a tropical identity" Archi-new - Free Dwg file Blocks Cad autocad architecture. Archi-new 3D Dwg - Free Dwg file Blocks Cad autocad architecture.  Home › news › OPUS offices and Toroposada Arquitectos styling center as "a tropical identity"
OPUS offices and Toroposada Arquitectos styling center as "a tropical identity"
Cooperation offices architects and OPUS Toroposada Arquitectos the design of the new Civic Center building in the city of Medellin, Colombia. He has Architects in this project to complete the first phase by shifting public void of the site with an area of 15 thousand square meters to urban base is composed of three floors of diverse jobs number, along with the twin towers of two overriding this platform, up 15 and 22 floors institutions; where he will join the offices of the Government of Antioquia Antioquia and Consulate Medellin Medellin city. 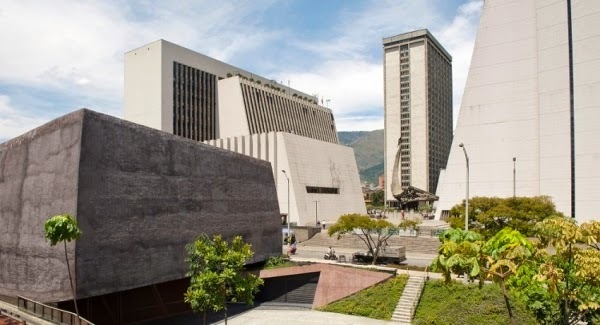 Besides those buildings there Binaan contemporaries includes first public television channel center Teleantioquia and production-related areas, while the second contains the runway cultural center and platform for cultural activities complementary institutional activities in the region. And are planning for the second phase will include the site where in addition to all these facilities building and hotel expansion horizontally to building the platform Urban. Among architects in the design of buildings Centre traditional elements of the city's architecture; such as squares, terraces and balconies and bridges, but they have carried out that contemporary manner commensurate with the formality of office buildings today. Architects won the terraces, balconies and bridges in the two towers built Bhrvhma building block for the outer structure of the building and thus resulting voids triangular projections on the facades reached between the two towers. Architects also keen to make the site a green as possible and that the cultivation of Urban Spaces and squares with different elevations so that "represents a society lives with his district own fertility." In the words of architects. "The project stems from the contemplation region; geography, natural environment, and cultural diversity. It serves as a bet on a building where the identity of the tropical climate and environmental conditions are the starting point." According to the architects.